In Build 322, we made a small, but helpful addition to our Stamps toolbox, the ability to enter text descriptions for predefined stamps. Many of you welcomed that addition, but could not find where to enter the descriptions. 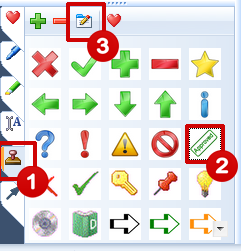 Click the Stamps Tab to open the Toolbox on the left bottom of the application window. Click the Edit button within the toolbox. In the Configure Tool window, enter your Description. Result: Your description will now display in a small tooltip when you move the mouse cursor above your stamp in the toolbox. In another Feature Spotlight article, read more about creating custom stamps in PDF.